In today's day and age, everyone is so busy. You're busy at work, to busy for the kids, "Ain't Nobody Got Time for That". Blah Blah Blah. It's all a bunch of crap. You're not that busy. And if you are, you're certainly not being productive. Not as long as you busy anyway. What kind of life do you have if you've ever told your kids, "Sorry little guy, I can't hang out with your right now. I'm too busy"? That just kills me. Mostly because I've said it before. And now I flash back at the disappointing smile on my little guys face. It's BS. You should never be too busy to hang out with your family. Productive is what you want to be. When you're productive you can put everything in it's place on the calendar. Yes, even time to hang out with your family. Being productive is an amazing filling because you're actually accomplishing stuff. You're moving the needle and you're getting time to yourself and your family. It's all crazy important to living a life of abundance and being an abundant leader. Teresa McCloy brings over 30 years of experience to both speaking and coaching. 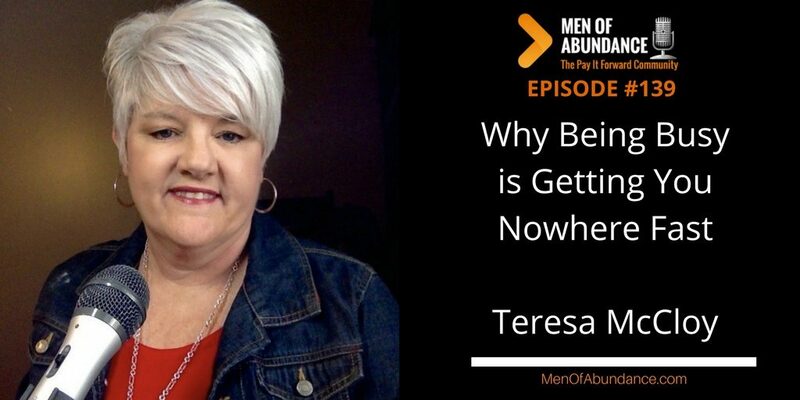 She has been a solopreneur and a leader in both business and ministry giving me a wide range of experience leading teams, managing multiple projects and juggling systems at the same time. Teresa is a proud member of the Nationals Speakers Association, CCNI and the International Coaching Federation. She is on track to complete her coaching certification with both PCCI and the ICF by the end of this year. Currently, she serves as an Ambassador for our local 2017 CEO Entrepreneur program for High School Seniors as well as being an active member of her local Chamber of Commerce. She has a certification both as an Enneagram MOS Practitioner and the 12 Week Year™ Trainer. You never want to be the man that says "I'm too busy to..." Get productive. Take control of your calendar and get control of your life.